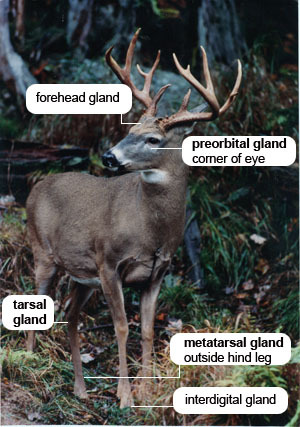 The metatarsal gland is located on the outer hind legs of the deer halfway up the heel. Very little is really known about this gland. Researchers have speculated on everything from heat regulation to an alarm scent. Some even claim that it is not a gland at all. Located on the forehead between a deer's eyes. Used by deer again for communication purposes. The forehead gland secretes an oil like substance that can darken the forehead between a buck's antlers. You may have noticed that many older more dominant bucks, and some does, have a pronounced orange color patch in this area. The gland is used by bucks when rubbing trees, leaving a personalized trademark and establishing their status in the herd.